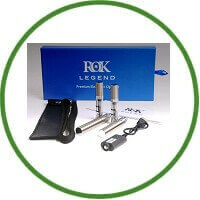 ROK Legend E-cigarette is a really nice looking, simple electronic cigarette. There are no advance features such as variable voltage or variable wattage etc. but this device is intended to simply be picked up and used. ROK Legend E Cigarette Unique Features And Great Performance! This is certainly a basic starter kit and is especially ideal for new vapers! That said though, many experienced vapers would still be happy enough to use the Legend. It’s easy to carry around with you and fits nicely in a bag or your pocket. We like the great features the Legend has to offer, such as a traffic light LED indicator light built in around the fire button. When battery charge is good, the LED is green each time you press the fire button. As the battery charge level drops, the colour changes to yellow and finally when the charge is low, the indicator light glows red. We think that is a clever and very handy feature! Another great feature of the Legend is the screw on top cap. This is something that you really don’t see from any other brands. The idea of the screw on top cap is to keep dirt and dust out of your mouthpiece. Nice! The Legend battery is rated at 900mAh which means you will easily get a full day of use before needing to recharge. ROK colour is silver and we can’t see any other colour options. That really shouldn’t be a problem for most though as silver really seems to suit the device. How Does The ROK Perform? The ROK Tankomiser has performed extremely well, producing good amounts of vapour and a real clean taste. Do bear in mind that the tank will eventually need to be replaced but they are readily available on the ROK website. Charging the ROK Legend is easy with the included USB cable. You can connect to a PC when the battery had finished and charging in about 2 & 1/2 hours. This will vary slightly though. The USB charger cable features a built in overcharge protection feature, which are really pleased to see as it’s essential for maximum safety! As previously mentioned, battery life is pretty good lasting most people a full day. If you are a real heavy vaper though, you may need to get it on charge towards the end of the day. Refilling the ROK Tankomiser is very easy, by removing the mouthpiece and then filling the tank, avoiding the centre hole. The Legend can be locked by pressing the fire/power button 3 times quickly. Pressing the same button again 3 times unlocks the battery ready for use. This is a handy feature to have and avoids the e-cig firing while it’s in your pocket. This is a really nice looking, simple electronic cigarette. There are no advance features such as variable voltage or variable wattage etc. but this device is intended to simply be picked up and used. It does have some unique features such as the traffic light LED battery level indicator and the screw on top cap. In use, the Legend works really well and produces more than enough vapour. E-liquid flavours come through clean and strong and most importantly, it keeps you from using traditional tobacco which is of course the result we are looking for! ROK Universal is based in the UK and was established in 2009. They offer same day dispatch on orders placed before 2.30pm and deliver free of charge, for all orders over £50. You can also collect ‘ROK reward points’ which give a discount on future orders.